God will be there tomorrow and everyday when life is hard and when your faith is severely tested. The author Julia Audrina Carrington who is a Christian who has served God shares some horrors she has been through and how her faith in God overcame in these difficulties. God will bless you as you trust in Him. This book will bless and inspire your faith aVery interesting. Get the book now! 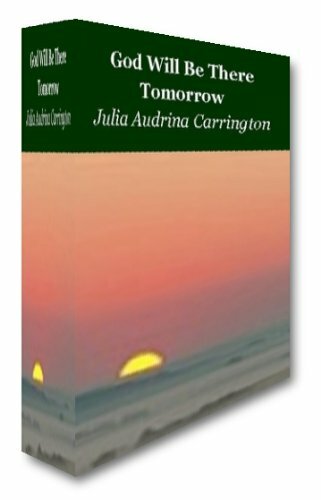 “Julia Carrington draws from the depth of her relationship with God to connect her readers to His heart and His voice. She knows the language of God and writes encouraging her readers to know His voice and follow Him.”–T.C. “Thanks be to God. I read one of her books, which was very good. She is a Christian first and foremost, and an awesome writer. If you have never read one of her books, let me encourage you to do so. Amen.”–R.C. “This is a writer with whom I have the honor of reading from her works. I know personally her love of the true Word of God and particularly her love of Jesus Christ.”–K.H. It is Julia’s desire to glorify God in all things. Julia Audrina Carrington who is a born again Christian has touched the lives of thousands of souls across the world. She has shared the message of hope with orphans and the less fortunate. She is the founder of the international mission called Mission Friends for Christ which reaches out to needy and hurting women and children. She is the author of more than five hundred Christian books and Christian novels. See many of her books at www.amazon.com by typing her name Julia Carrington in the search box on www.amazon.com. Her books make wonderful gifts for all occasions. Get her books today for yourself and for family and friends as perfect gifts for all occasions.